Autism Spectrum Disorders are complex disorders that are diagnosed based on behavioural symptoms including social and cognitive impairments, communication difficulties and repetitive behaviours. Interestingly, many of the genes that have been implicated in Autism encode proteins found at excitatory synapses in the brain. In this research proposal we will form an international collaborative research effort to test the hypothesis that the Autism-associated mutations in these synaptic proteins disrupt the function of synapses. Using electrophysiology recordings as a measure of synapse function, we will compare how proteins that are associated with Autism can alter synapses in the hippocampus, the part of the brain critical for cognitive functions such as learning and memory. We will also begin to determine the mechanisms underlying how these changes occur. These experiments have the potential to determine how the formation, plasticity and maturation of excitatory synapses may be disrupted in Autism, leading to interference with cognitive function and behaviour. This award will enable Dr Montgomery to spend four months in the laboratory of Prof Craig Garner at Stanford University, to establish a new area of collaborative research in the field of autism. The establishment of a new cellular model of autism is a major joint venture with significant potential to identify potential targets for treatment. This new cellular model will be established in Auckland on her return. The brain has a capacity for self-repair through the generation of new brain cells. However, this ability is limited due to poor integration of new cells into neuronal networks. We have found that neurogenesis continues in vitro in cultures prepared from the hippocampus, a region of the brain that is critical for memory formation. Using these cultures we characterised the molecular composition of synapses formed by newly generated neurons. The expression of many proteins and receptors that are essential of synaptic transmission and/or plasticity differed between the synapses of newly generated and mature neurons. Furthermore, we found that the difference in the expression of NMDA receptors, that are important for synaptic integration, may result from differential trafficking of these receptors to synapses compared to mature neurons. In addition, the basal functional properties of newly generated neurons are different from mature neurons, which may result from altered expression of synaptic proteins. This research furthers our understanding of how new neurons integrate into networks and may provide molecular targets that could be the key to unlocking the brains potential for self repair. Hearing loss or deafness is a major sensory disability affecting 10-13% of the New Zealand population. As the prevalence of hearing impairment increases with an ageing population, we are faced with a deafness epidemic with significant social and economic consequences. The majority of hearing loss occurs because of diseases or injury to the cochlea in the inner ear. While significant advances have been made in understanding these disease processes, a major impediment to further, thorough study is the cochlea’s location deep within the bones of the skull. Recent advances in Magnetic Resonance Imaging (MRI) technology offer innovative opportunities for the study of disease processes non-invasively. This research project will investigate the use of MRI technology to study chronic inflammatory process in the animal inner ear, which we have not been able to do previously. We hope to then translate these findings to humans. These findings will, in turn, revolutionise diagnostic and treatment approaches for hearing disorders. According to the World Health Organization, hearing loss is a major contributor to the global burden of disease and significantly affects over 250 million people world-wide. The vast majority of hearing loss occurs because of the degeneration or death of either hearing sensory hair cells or auditory nerves. Mammalian hair cells do not regenerate, so the hearing loss from such cell loss is permanent. Clearly with this background of terminal injury it is essential to maintain the functional sensory cell population through disease and aging. The proposed study will draw on recent findings that there are specific molecules secreted in the ear that orchestrate protective or reparative responses to stress in the inner ear. We will determine if this is a mechanism for maintaining normal sensory cell integrity in the mammalian ear and if under stress this molecular signalling pathway becomes a protective mechanism that regulates cell survival. In this study, we will use different techniques including cell culture and animal models to provide therapeutic interventions directed at hair cell survival after exposure to ototoxic drugs. Findings from this study will help define drug approaches to protect or repair the sensory structures of the inner ear under metabolic stress. Creatine is required for the storage and distribution of high energy phosphates in cells with high and fluctuating energy demands. This energy precursor and dietary supplement has moved to centre stage as a highly promising neuroprotective agent. Creatine is being tested in large-scale clinical trials for the treatment of Parkinson’s and Huntington’s disease. Despite its therapeutic potential, how creatine protects neurons remains poorly understood. Our hypothesis is that uptake of creatine into neurons occurs close to sites that produce the energy needed for critical brain activities. We will investigate how the creatine transporter is moved to mitochondrion-rich dendritic compartments of neurons, whether movement of the creatine transporter and mitochondria are coordinated, and how modulation of creatine transporter activity affects mitochondrial activity and synaptic function. This project will provide novel information about the spatial organization of the creatine transporter within compartments of neurons in relation to sites of energy production. Our research may lay the foundations for the development of new therapies to treat neurodegenerative diseases and brain injury. Repatriation Fellowships are intended to support the repatriation of outstanding young researchers who have recently completed postdoctoral studies outside New Zealand and who propose to return to New Zealand and conduct research in scientific fields of relevance to the Neurological Foundation. Dr Cawston will return to New Zealand from her position as Research Fellow in the Department of Pharmacology and Experimental Therapeutics at the Mayo Clinic Arizona. Huntington’s disease (HD) is a hereditary genetic disorder of the brain that involves symptoms of disturbed movement, mood and mental processes. There is no treatment. This project will take two approaches to improving the development of novel therapies for HD. Firstly, to examine the signaling pathways of the specific receptors in HD cell lines to optimise their neuroprotective effect on cells. Secondly, to develop an new human cell model of HD toxicity for further studies into the mechanism of toxicity and potential drug screening. Memory impairment is a common feature of neurodegenerative conditions such as Alzheimer’s disease. It profoundly affects wellbeing and has a huge impact on society. Accordingly, understanding the molecular mechanisms that underlie memory function and dysfunction is a major focus of neuroscience research. While the way in which the brain stores memories is not yet fully understood, it is known that long-lasting enhancement in chemical signaling between two neurons called long-term potentiation (LTP) is a key component in memory. Maintenance of memory through LTP depends on new gene expression. Newly discovered molecules termed microRNA are thought to contribute to control of LTP-regulated gene expression. The objective of this research is to investigate the changes in microRNA expression that occur during the late phase of LTP. This research will enhance our understanding of long term memory and may lead the way to new treatments for memory loss. Macrophages are multifunctional immune cells and are key mediators of inflammatory immune processes. During inflammation the immune 'climate' of an organism shapes the type of immune response that develops and directs immune cells such as macrophages to promote or resolve disease. Malaghan Institute Research Associate Dr Anne La Flamme and colleagues have shown that treatments that alter a macrophage's state of activation, and thus alter the immune climate, can prevent central nervous system inflammation and progressive paralysis in the murine model of human MS - experimental autoimmune encephalomyelitis (EAE). Identification of the pathway(s) by which these macrophage altering treatments prevent disease may uncover much-needed therapeutic targets to inhibit or reduce the severity of MS. Immune cells including T cells, macrophages, and microglia (brain-resident macrophages) are responsible for the damage to the nerves and subsequent clinical features of MS. While many current MS treatments target T cells, because microglia are involved in controlling central nervous system inflammation and damage, microglia may also be a valuable target for new therapies. Dr Anne La Flamme and colleagues are investigating the immune factors that regulate microglia function in the brain using the EAE model of MS, in the hope that targeting these factors will prevent central nervous system inflammation and damage. Current disease-modifying therapies used to treat individuals with MS have variable efficacy in reducing the neurological and physical disability associated with the disease. Recently Dr La Flamme's research group have demonstrated that drugs that prevent cellular proliferation, such as those used to treat cancer patients or immune-modulatory drugs that work to suppress immune responses, are also effective at reducing the incidence and severity of MS in experimental disease models. Dr La Flamme is currently investigating the potential of these classes of compounds for treating MS with the hope that the use of drugs that are already in clinical practice, or are in the process of gaining FDA approval for clinical use, will accelerate the path from drug design to clinical application. Experimental autoimmune encephalomyelitis (EAE) is a well established murine model of multiple sclerosis (MS) that has been used by scientists at the Malaghan Institute to better understand the causes of MS, and to test the therapeutic potential of compounds designed to halt its progression. An important outcome of this work has been the identification of a key role for blood monocytes in maintaining immune tolerance in EAE. The monocytes were shown to suppress inflammatoryT cell responses in naive mice but lost this function when EAE was induced. The MS drug Glatiramer acetate was shown to be taken up by the monocytes and cells exposed to the drug demonstrated increased intrinsic T cell suppressor activity. Similar outcomes were obtained with an immune-modifying superantigen compound developed by Prof John Fraser. These findings have important clinical implications for the design of novel immunotherapeutic agents that target specific cell types for the treatment of individuals with MS.
We have recently identified and described a long distance pathway for cell migration in the human brain. Although this pathway is predominantly for the supply of new olfactory neurons, it would be desirable to alter the migration direction from the olfactory system toward areas of the brain that are damaged in neurodegenerative diseases. Therefore, we plan to use detailed histological and molecular techniques together with ultrastructural techniques to identify how cells in the human brain, and under the influence of what key molecules, migrate so that we can alter the course of progenitor cell migration in neurodegenerative disorders. The key findings from this study involved identifying two factors (polysialyltransferase and sialyltransferase) that are believed to be responsible for adding the slippery coating, called polysialic acid, that surrounds progenitor cells and reduces the friction so they can migrate. Two other factors that remove polysialic acid (Neuroaminidase 3 and 4) have also been identified. In a cell culture system we have identified that as the progenitor cell matures, the polysialic is removed and thus the cell stops migrating so the cell can receive cues about differentiation from the local environment. The human stem cell migration system also uses these same factors to control migration of stem cells and our studies have identified the relationship between the two polysialic acid regulating factors. These results are extremely important because they allow us to understand what causes cells to begin to migrate and what causes them to stop migrating. The results from this work are expected to form the basis of two publications. We are extremely grateful for the support of the AMRF in making these projects possible. The symptoms of Parkinson’s disease are well known to many people – an uncontrollable tremor, muscle rigidity and a shuffling gait, to name a few. However, less well-known is the fact that most of these patients start to lose their sense of smell several years prior to the onset of any motor symptoms, a condition known as anosmia. This is thought to be attributed to dysfunction within the rostral migratory stream (RMS); a ‘motorway’ of stem cells capable of replacing dying neurons that was first identified in the human brain by researchers from the University of Auckland in 2007. Therefore, the focus of this project is to further characterise the behaviour of cells and identify the determinants of ‘traffic’ within this motorway. Furthermore, investigating what happens to the RMS in Parkinson’s disease will greatly assist in identifying potential intervention points where neuronal loss can be stopped, before it is too late to prevent the motor symptoms. This project will give us further insight into Parkinson’s disease and also into how stem cells migrate in the brain. Neurological diseases such as Parkinson’s disease and stroke are often characterised by speech which is difficult to understand (dysarthria). Speech therapy to help those with dysarthria traditionally focuses on improving the speech of the patient. However, recent collaborative research between Dr Borrie at Canterbury University and Dr Julie Liss from Arizona State University has demonstrated that people can be trained to better understand this difficult speech. This opens the door to the concept of training the partners or caregivers of those with dysarthria to better understand their speech. Dr Borrie will spend two years in Dr Liss’ department furthering this new approach; specifically examining how improved understanding of dysarthric speech is influenced by ageing and by information provided in the speaker’s face. This research will advance the development of a novel treatment approach that improves understanding of dysarthric speech. Transient ischemic attack or TIA, heralds the onset of a stroke in a quarter of the 8,000 New Zealanders struck down by this devastating illness every year. TIA is important as it provides a window of opportunity in which to prevent stroke in up to 8 out of 10 people. Little is known about the numbers of people having TIA, or the risk of stroke, in an age of aggressive risk factor management. New Zealand is an ideal place to carry out this research because of the huge experience in performing this type of “incidence study” and because of our ethnically diverse population. This research aims to perform the largest TIA incidence in recent years and the first such study in New Zealand. Abstract — Vestibular symptoms are persistent and problematic sequelae of blast exposure. Several lines of evidence suggest that these symptoms often stem from injury to the central nervous system. Abbreviations: BPPV = benign paroxysmal positional vertigo, CDP = computerized dynamic posturography, CNS = central nervous system, DSI = dual sensory impairment, MSI = multisensory impairment, mTBI = mild traumatic brain injury, PIVC = parieto-insular vestibular cortex, PTSD = posttraumatic stress disorder, SVV = subjective visual vertical, TBI = traumatic brain injury, VOR = vestibulo-ocular reflex. Many people who experience a traumatic brain injury (caused by an external force to the head such as from a car accident or fall) often find that they have difficulties with memory, fatigue and headaches. NeuroAid II is a 100% natural herbal supplement that could potentially improve cognitive functioning and fatigue after brain injury. Previous testing has shown that NeuroAid II protects cells from dying after injury as well as stimulating the generation of new neural cells, connections and pathways. 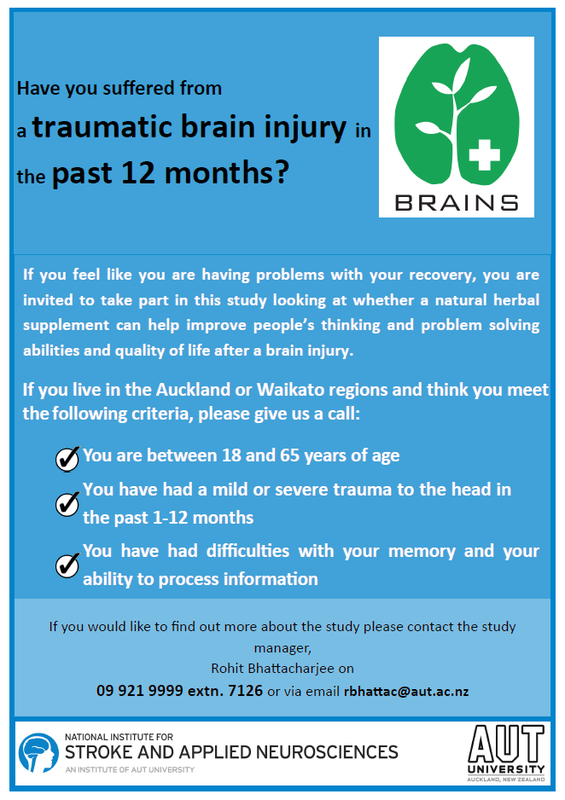 This study will trial the supplement on adults aged 18-65 who experience a brain injury in the last 1-3 months ago over a period of 6 months to demonstrate whether NeuroAid II is effective at improving neurocognitive recovery within this population. If you have any questions about this study, or would like to know if you can take part, please contact the Study Manager by email or on 09 9219999 ext. 7126.